Imagine someone asked you to describe the best lesson you ever taught. Which lesson would you choose? What do you think made that lesson so awesome? Let me guess. 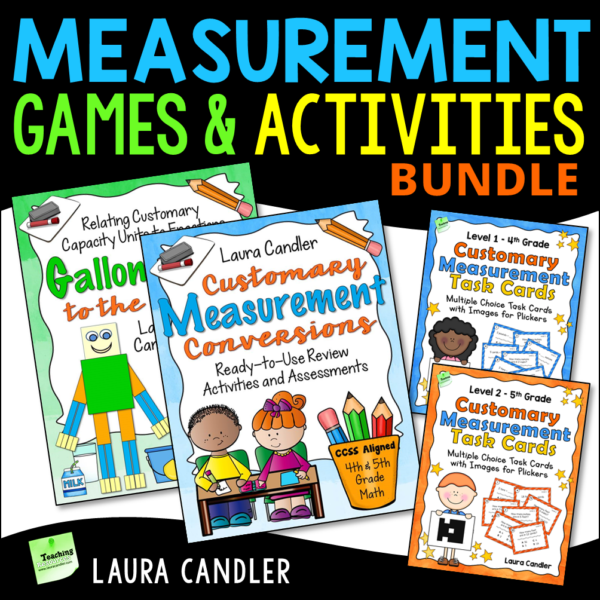 It was probably fun for both you and your students … maybe a hands-on math lesson, a science investigation, or a cooperative learning activity. But I’ll bet it was more than just fun. Your best lesson was probably rigorous and challenging, too, and one reason it was so memorable was because you could see that your students were GETTING IT! We all love those “light bulb” moments where everything clicks into place and the magic of learning happens. So what makes a lesson really amazing? I used to think hands-on learning and active engagement were the critical factors. Clearly my students were having fun during these lessons, and it looked like they were learning, too. But you know what I discovered? A fun lesson isn’t necessarily an effective one. You’re nodding your head right now if you’ve ever taught a highly engaging lesson, only to realize the next day that your students didn’t actually LEARN the key concepts. For example, kids can have a blast creating wind-powered cars from straws, spools of thread, and paper, yet not have a clue about wind as a renewable energy source. Unfortunately, I also discovered that making a lesson more rigorous doesn’t mean it will necessarily be more effective. When the content is too challenging but kids aren’t motivated to learn, they often get frustrated and give up. So what’s the secret to a great lesson? There are actually two of them: rigor and fun! Kids learn best when a lesson is rigorous enough to activate higher level thinking, AND enjoyable enough to motivate them to stick with it, even when frustrated. I created the graphic organizer below to illustrate the concepts more clearly. 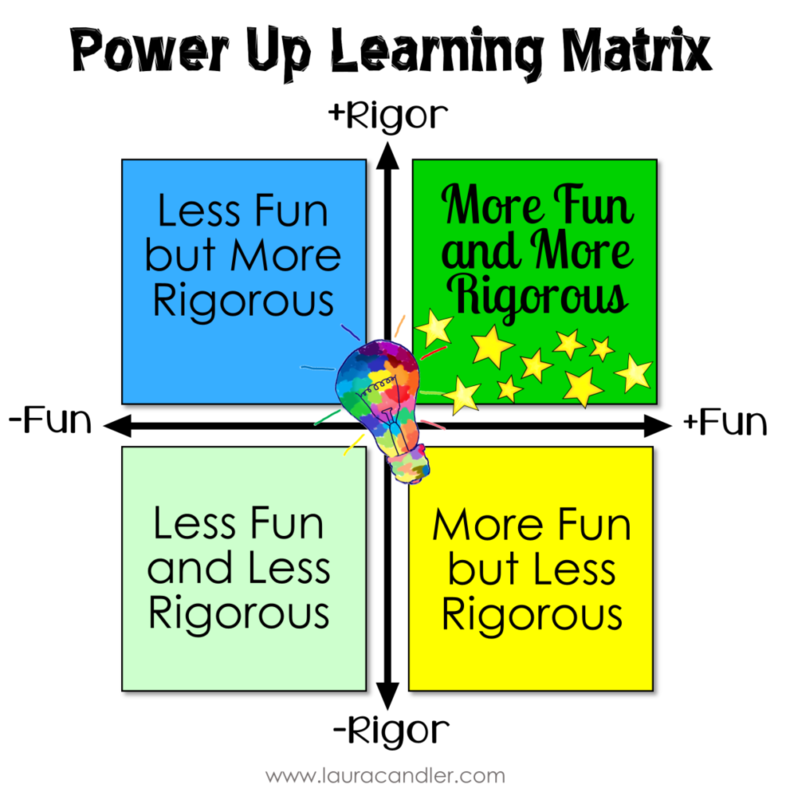 In a nutshell, the Power Up Learning Matrix is a visual scale for rating an activity according to two overlapping factors: RIGOR (vertical axis) and FUN (horizontal axis). 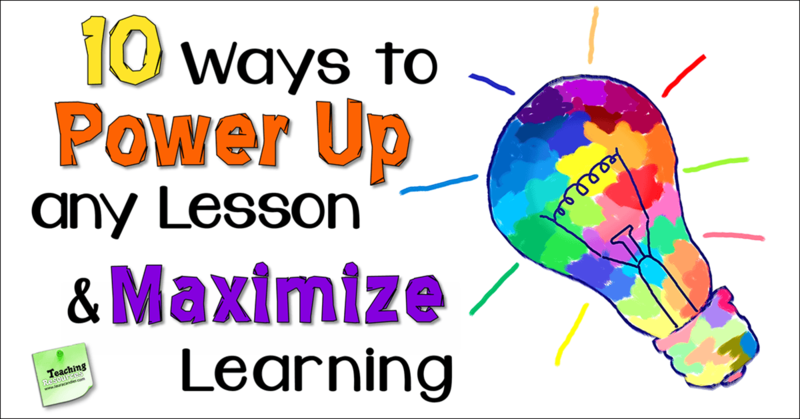 I explained how to use the Power Up Learning Matrix during my math vocabulary-building webinar, and if you’re interested in learning more, watch the replay of Powerful Strategies for Building Math Vocabulary. Light Green – Activities that are not fun and not very rigorous</b; most are not particularly effective; skill and drill worksheets, crossword puzzles, etc. 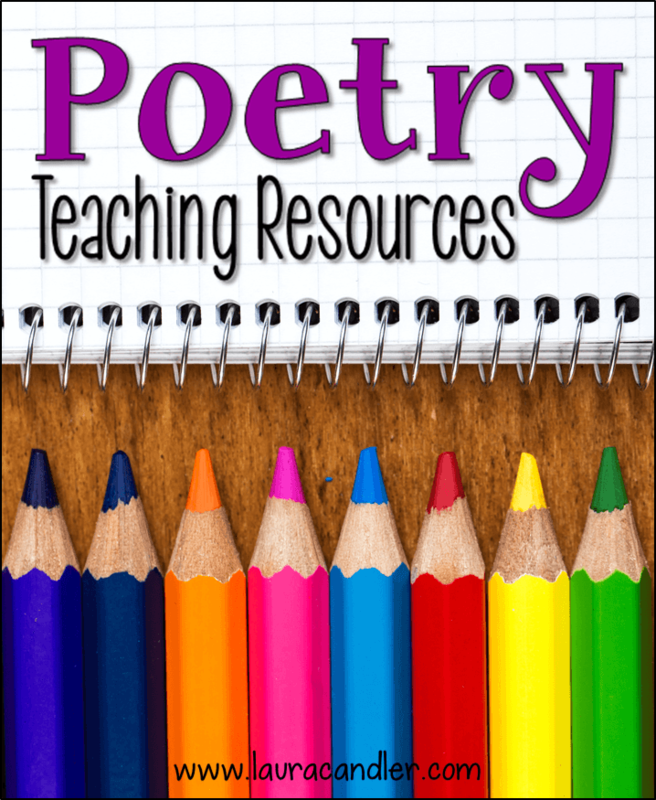 Blue – Activities that are more rigorous but still not very fun; may be somewhat effective; worksheets and other independent seatwork with more challenging content, word problems, test prep activities, etc. Learning theories are great, but they aren’t worth much unless we can put them into practice. By now it should be obvious that the trick to improving any lesson is to make sure it’s both fun AND rigorous. 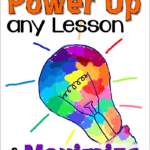 If it’s lacking in either or both, we can “power it up” using one or more of the 10 strategies described below. These lists are not meant to be all inclusive, so feel free to add your own suggestions in a comment on this post. Also, sometimes a strategy serves two purposes because it increases the rigor AND it makes the activity more fun! Use a text with a higher reading level; in math, present more challenging or difficult problems; include multi-step word problems that integrate several content areas, ask higher-level questions. Include a writing component in every lesson (journal writing, written reflections, written explanations). Instead of asking multiple choice or true/false questions, ask open ended questions that require complete sentence answers. 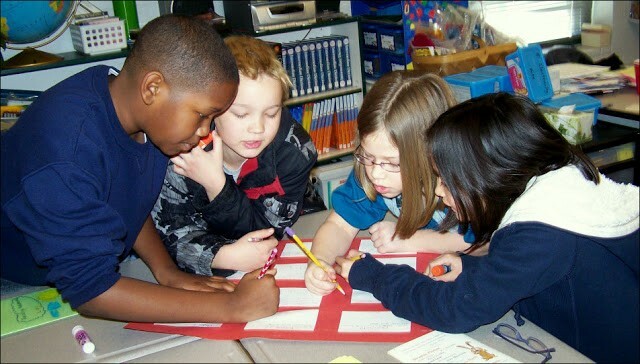 Cooperative learning activities increase rigor while also making almost any activity more fun. You can do something as simple as stop every 5 or 10 minutes and ask students to turn to a partner and explain or justify their thinking. Or you can include more elaborate lessons that involve dynamic group skills. This one used to be more challenging to do, but it’s super easy now! Educators have so many great apps, devices, and other tools available now that the main problem is choosing the best tool for the job. One of my favorite ways to incorporate technology is with the free Plickers program. If you’re not familiar with it, you might enjoy watching my free webinar, Interactive Teaching with Plickers. Any time you can turn an activity into a game or make it seem like a game, you’ve instantly increased its fun factor! Next time you plan a review lesson, skip the worksheets and bring out the task cards! 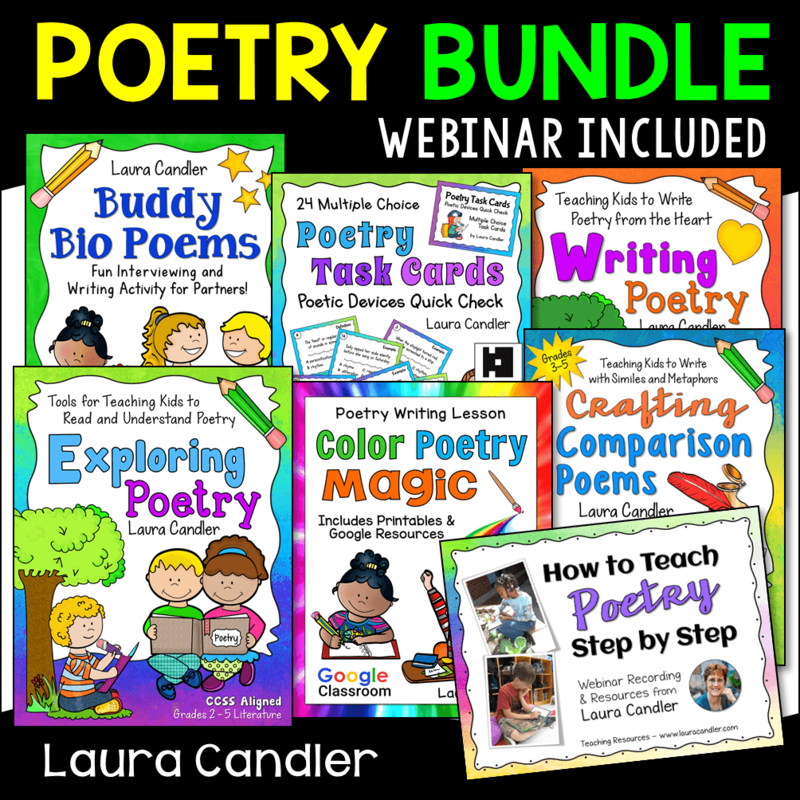 If you’re not sure how to use them and you’d like to learn more, sign up to watch the replay of Power Up Learning with Task Cards, a webinar I presented with Rachel Lynette. It’s amazing how getting up and moving to another seat or another area of the room can make an activity seem like more fun! For example, Team Scoot is a quick way to energize your class. After each problem or question, your students have to get up and move to the next seat before answering another question which means they are frequently moving, but also working on assignments or tasks. When you think “hands-on,” you might imagine math or science activities that require special manipulatives or tools. 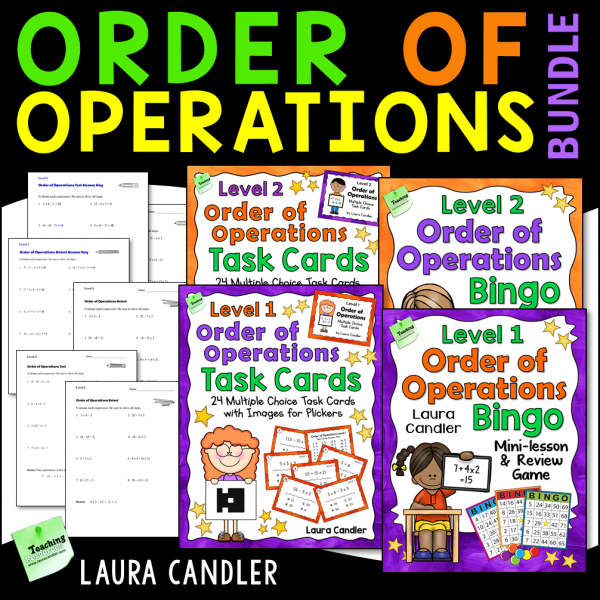 However, “hands-on” can also refer to concept sorting activities where words, shapes, or numbers are printed on paper and students sort them onto a graphic organizer. These activities are far more fun than worksheets, and far more effective, too. My geometry game Classify It! is an example of an activity that’s both fun AND rigorous. The image below shows some of the game components on the left, and students actually playing the game on the right. In order to win the game, students must have a thorough understanding of quadrilateral classification. Fortunately, students who are a bit rusty on the rule for classifying quadrilaterals will deepen their understanding as they play. 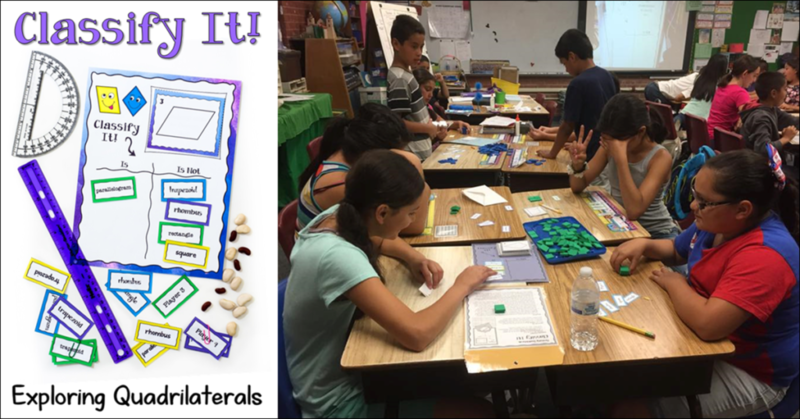 For all the reasons I shared in this blog post, Classify It is truly powerful game for learning to classify quadrilaterals! Think about an activity or lesson that you’ve taught lately or plan to teach soon. What are some ways you can “power it up” and make it more effective?